I’ve been thinking of giving up grains for 30 days to see if I experience any significant changes in my health. Mind you, I feel pretty darn healthy most of the time, but there are those minor, in some cases–frequent annoyances. For example, the inside of my nose is often wet in the mornings. It’s usually not enough to bother blowing, but I can feel it, and it’s definitely annoying. I also have scalp psoriasis, which I’ve had since my mid-20s. You usually can’t see it, but I can almost always feel it. To both issues, my doctor says it’s likely a very low-grade allergic response to something I eat regularly. But what? I did the food sensitivity testing and that didn’t reveal the culprit. A while ago, I gave up dairy for two months, and that didn’t help. I went gluten-free for several months, and that didn’t do anything (although I noticed the skin on the back of my upper arms became incredibly smooth). So maybe it’s grains–not particularly gluten. Of course, I’m not one of those people who simply dive into things, and it’s hard for me to imagine giving up all dairy, grains and sugar for 30 days! First, I need to research the proposed change and test it out to see if I think I can really handle it. So along those lines, I’ve been making all sorts of dairy-free and grain-free dishes–many of which you’ll see soon on this website. When I gave up gluten I turned to corn–NOT a great alternative since it’s one of the oldest genetically-modified crops in the world (certainly here in the United States). But I love cornbread and I love guacamole and salsa, so corn serves me well in that regard. But what happens when corn and rice are also off the menu? I’m a snacker and still require something crunchy I can reach for during the mid-afternoons. As part of experimenting with Paleo, I bought Against All Grain by the best-selling author and blogger, Danielle Walker. She realized early on that people can’t survive on meat and vegetables alone (emotionally, not physically), so her book contains all sorts of snacks and desserts as well as salads and meat dishes. 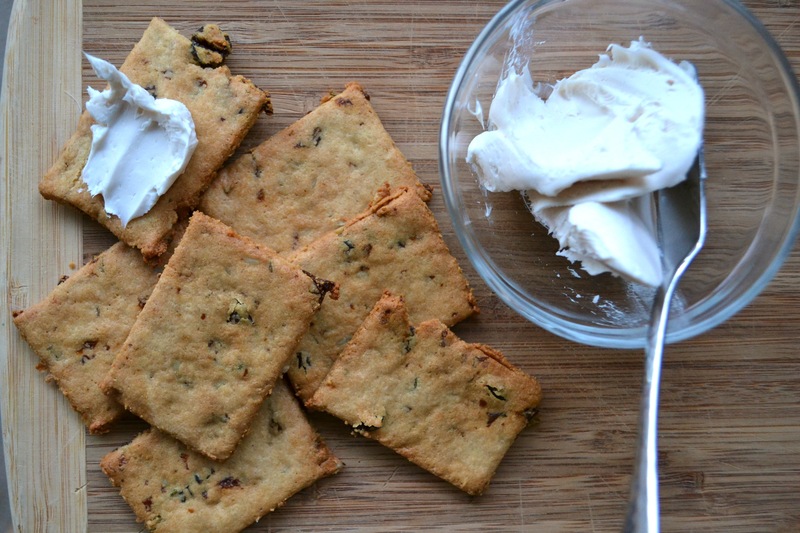 I tried her grain-free Raisin-Rosemary Crackers and loved them! They are super easy to whip up, and contain a nice balance of sweet, salty and crunchy. I only modified the recipe ever so slightly in ingredients and instruction. If you have a regular-size food processor, put all the ingredients except the 1 tsp sunflower seeds in the processor. 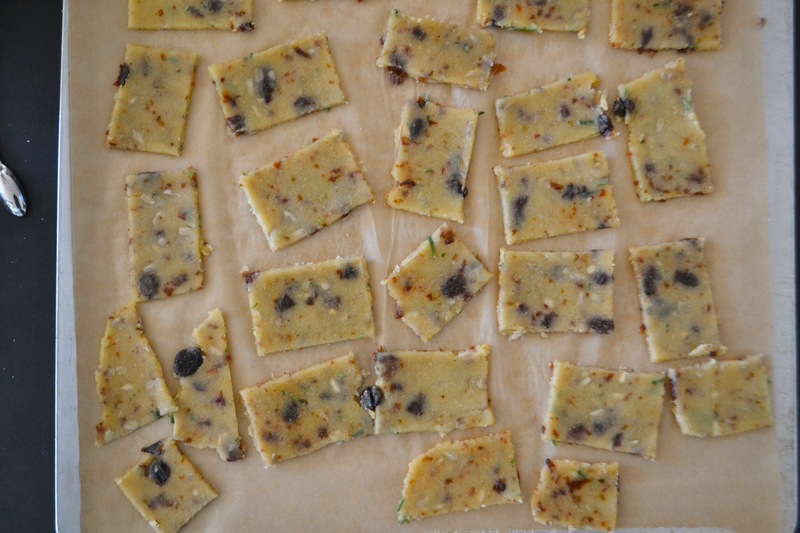 Process for 15 seconds, or until the ingredients are well mixed and the raisins and rosemary leaves are chopped into small bits. 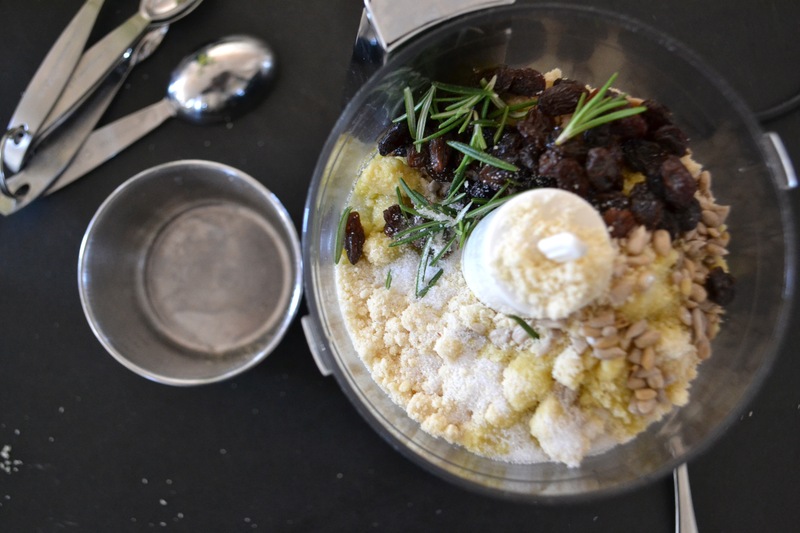 If you don’t have a regular-size food processor, like me, and have to rely on a mini-processor (like my mini Krups), put in all the ingredients except the almond flour and process until the raisins and rosemary leaves are chopped into bits. Then add the “flour” and process until the dough comes together (several 2-second pulses on my machine). Form the dough into a squarish shape and roll between two pieces of parchment paper until you have a 1/8-inch thick rectangular shape. Remove the top sheet of parchment. Use a sharp flat-edged knife or pizza cutter to cut the dough into 1-inch x 2-inch rectangles. Save the end bits to re-roll in the first piece of parchment to make more crackers. 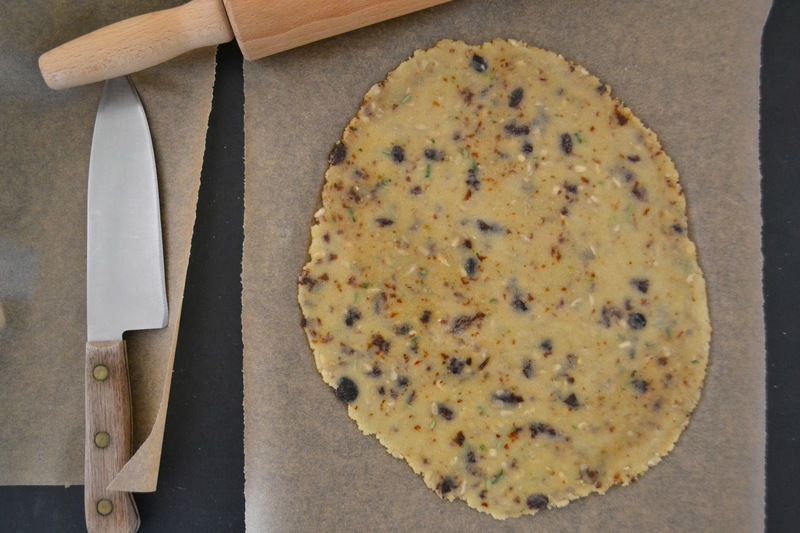 Carefully transfer the parchment paper to a baking sheet. You can bake as is, or carefully separate the crackers from one another. I find they bake better when they’re separated. Bake for 10-15 minutes, rotating the pan once, until the crackers are golden and browning slightly on the edges. Cool completely before serving. Serve with dairy-free “cream cheese” or a piece of prosciutto.